Ayurvedic Nasya Oil (Nasal Oil), based on fine sesame oil. Takes care of the nasal skin and prevents it becoming too dry. Two or three drops inserted daily in each nostril is an integral part of the daily routine of Ayurveda. Ayurveda recommends several types of aqueous, powdery, oily or other preparations for the nose. Nasya refers to the use of this age-old Ayurvedic tradition. According to Ayurveda, Nasya should be an integral part of the daily routine and can be done several times a day. 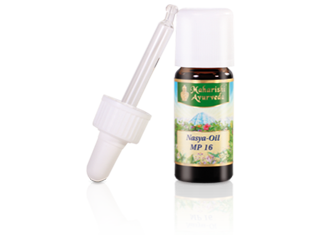 Maharishi Ayurveda Nasya Oil for nasal care is made up of an abundance of beneficial herbs, oils and spices. With vetiver, nut grass, cinnamon, cardamom, sandalwood. In the 10 ml bottle it's a practical companion both for travelling and at home. Also available in 50 ml. With practical dropper for hygienic use. With matching screw top lid. Ayurvedic herbal oil for nasal care. Apply 2-3 drops with the finger, near the nostrils. Several times a day.